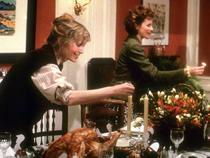 Overview - Three sisters deal with their tangled relationships amidst the wonders of New York City. Despite our grand and infinite searching, it turns out that the ever elusive meaning of life just might be found in, of all places, a Marx Brothers film. At least, that's the conclusion that one character comes to in Woody Allen's 'Hannah and Her Sisters' -- and really, I'm finding it difficult to argue with. A sweet, thoughtful, and understated mix of drama and comedy, the celebrated movie is among the iconic director's most heartfelt and insightful efforts. Through the intersecting lives of three sisters, the writer/director muses on love, happiness, infidelity, mortality, and of course, a generous helping of neuroses. The story follows a trio of siblings, Hannah (Mia Farrow), Lee (Barbara Hershey), and Holly (Dianne Wiest), as they grapple with various ups and downs in their personal lives. On one front, Lee discovers that Hannah's current husband, Elliot (Michael Caine), is actually in love with her. Meanwhile, Holly struggles to make it as an actress but is repeatedly met with rejection. All the while, Hannah serves as the self-sufficient glue which holds the family together, but even her stable demeanor has its limits. Faced with a variety of existential crises, the family attempts to maintain at least some small measure of contentment. 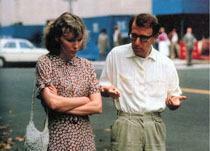 Like many Woody Allen efforts, the script features an episodic structure, and the director frequently swings the film's focus from character to character. Simple inter-titles help to set up and differentiate the intermittent segments, but despite this fractured narrative, the story still feels very smooth, organic, and unified. The various disconnected pieces are all tied together by overarching themes and shifting couplings, keeping the different subplots cohesive and relevant to one another. Periodic voice over narration helps to clue us into different characters' internal monologues, revealing all their private insecurities, desires, and rambling self doubts. Keeping in line with this, and the director's overall trademark sensibilities, much of the film's sharp humor comes from neurotic observations and quick witted quips. While this leads to some very funny moments, the movie is also home to a strong dramatic backbone. Allen's script tackles some thought provoking concepts dealing with familial bonds, the fragility of life, and mankind's all consuming battle between pessimism and optimism. As weighty as all these ideas are, the director manages to temper the film's potentially heady philosophical and intellectual content with an almost blithe, soft-spoken sincerity. Though it flirts with comical cynicism, this is an ultimately uplifting and life affirming tale, and Allen comes to these conclusions in a charmingly unassuming manner. The three lead actresses headline an exceptional ensemble, and all of the performers bring a natural, effortless reality to their characters. Barbara Hershey's Lee finds herself stuck in a moral quandary when she reciprocates feelings for Hannah's husband, and she does a wonderful job of playing all the character's conflicted emotions. Likewise, in an Academy Award winning performance, Michael Caine is equally fantastic as Hannah's emotionally clueless cheating husband, and the actor really sells his torn, guilt-ridden infatuation/love for both women. In the similarly Oscar winning role of fledgling actress Holly, Diane Wiest is appropriately aimless, frustrated, and a bit delusional, but when her character finally finds her niche, the payoff is very rewarding. Capping off the main ensemble is Woody Allen himself, who furthers his classic, anxiety ridden on-screen persona through Hannah's hypochondriac ex-husband, Mickey. The character's humorous quest to finally find meaning in the universe leads to some of the movie's funniest and most perceptive moments. Though her name is the only one featured in the title, on the surface, Mia Farrow's Hannah actually gets the least development, but her centralized place within the oscillating narrative makes her an indispensable piece of the story's larger shape. She's the cinematic fulcrum from which all the various characters and plotlines intersect and pivot, bridging the gap between relationships and conflicts. Farrow does great work in the part, adding subtle layers of depth to Hannah, and coupled with Hershey and Wiest, the three actresses make for a very believable and dysfunctional family. This is a dialogue driven effort, but Allen and cinematographer Carlo Di Palma's deceptively simple style keeps things visually interesting and cinematically potent. The director frequently uses wide masters and reframing extended takes. This allows the conversations and performances to keep developing uninterrupted by unnecessary cuts. The seemingly modest aesthetic might appear pretty straightforward, but there is some very intricate and thoughtful filmmaking at work here, utilizing deliberate tracks, pans, and dollies to follow and delicately enhance the action. One of the writer/director's most successful films when first released, 'Hannah and Her Sisters' remains a funny and poignant exploration of life, happiness, relationships, and all the unnecessary worrying that somehow gets in the way. The writing is charmingly humorous and sometimes strikingly insightful, and through comedy and drama Allen finds a perfect balance of conflict, honesty, and entertainment. This is the type of film that seems enjoyable enough as you watch it, but then manages to leave an even stronger impression as its heartfelt, matter-of-fact observations linger on. And if the mysteries and anxieties of existence somehow still plague your thoughts by the time the credits role, you should also check out the Marx Brothers' classic 'Duck Soup.' As Allen's character discovers, it just might save your life. 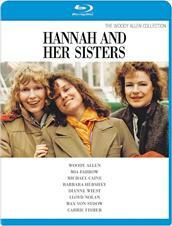 MGM presents 'Hannah and her Sisters' on a BD-25 disc housed in a keepcase. Some logos and warnings play upon start-up before transitioning to a standard menu. The packaging indicates that the release is region A coded. The movie is provided with a 1080p/AVC MPEG-4 transfer in the 1.85:1 aspect ratio. Though mostly authentic, this is a very modest looking video presentation that lacks real pop and dimension. The source print is in very good condition but there are some fleeting specks here and there. A moderate to heavy layer of grain is visible throughout, but can look rather fuzzy and a tad noisy in certain sequences. Detail is solid yet uneven, with some scenes offering pleasing clarity and others appearing a bit soft. With the exception of a few standout shots, the picture is predominantly flat and lacks a substantial sense of depth. There isn't much pop, but the subdued color palette is natural and effective. Though white levels are well balanced, shadow detail looks a little muddy in darker scenes. Grainy and flat, 'Hannah and Her Sisters' doesn't exactly wow on Blu-ray, but with the exception of some possible noise, the transfer appears to be faithful to the source. The film is provided with an English DTS-HD Master Audio 1.0 track along with Spanish and French Dolby Digital 1.0 tracks. Subtitle options include English SDH and Spanish. Like most Woody Allen efforts, this is a dialogue driven film, and while exceedingly basic, the mix is free of any major problems. Dialogue is clear throughout, but the track seems to be mixed rather low compared to other discs. Effects work is very sparse throughout, leading to a minimalist sense of atmosphere throughout the single channel of audio. The jazz and classical music selections that make up the brunt of the soundtrack come through well, but with the exception of scenes set during an opera and a rock concert, dynamic range is on the flat side. Thankfully, I detected no pops, crackles, or hissing. This is about as stripped down as an audio mix gets, but the music is pleasing and speech is readily audible throughout, making it easy to hear all of the characters' neurotic insecurities. Theatrical Trailer (HD, 2 min) - The theatrical trailer is included in 1080p with Dolby Digital 2.0 sound. 'Hannah and Her Sisters' is one of Woody Allen's most perceptive and unassuming efforts. Its ultimately simple and joyful observations on life are bolstered by effective drama, amusing laughs, and wonderful performances from a stellar ensemble. The video transfer and audio mix are very modest but seem to be faithful to their source. Like most releases from the director, this is a barebones disc, but based on the strength of the film itself, it's still a very easy recommendation.